Science stimulates and excites children’s curiosity about phenomena and events in the world around them. The school aims to develop the experimental investigative skills of science. These include observing, questioning, predicting, recording, and drawing conclusions. Science is taught through practical topics covering life and living processes, materials and their properties, and physical processes. We have developed our school grounds to maximise its use for such study. In Reception children are encouraged to explore the world around them. 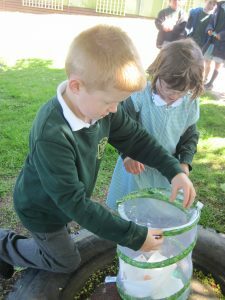 They grow plants, investigate what happens to things dropped in the water tray and ask and answer questions about their environment. In KS1 we spend quite a lot of time outside looking at changes in nature over the course of the year and learning the names of common British plants and trees. 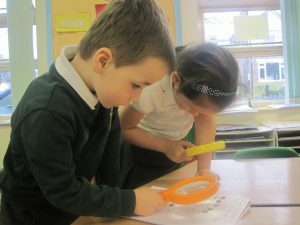 The children also plan and carry out investigations. This term they have designed their own way to test which material might make the best wrapper for some biscuits. We also look at lifecycles and have incubated chicken and duck eggs. In KS2 there are more investigations looking at things such as the water cycle, rocks and electricity. All the way through the school the children learn how to plan a fair test, how to set out their results and how to draw conclusions. All this makes science at Hutton an exciting, hands on subject.